Comedy Central's Nathan for You is currently in the midst of its third season, and fans of the show's star Nathan Fielder, will get to see him on the big screen next week. 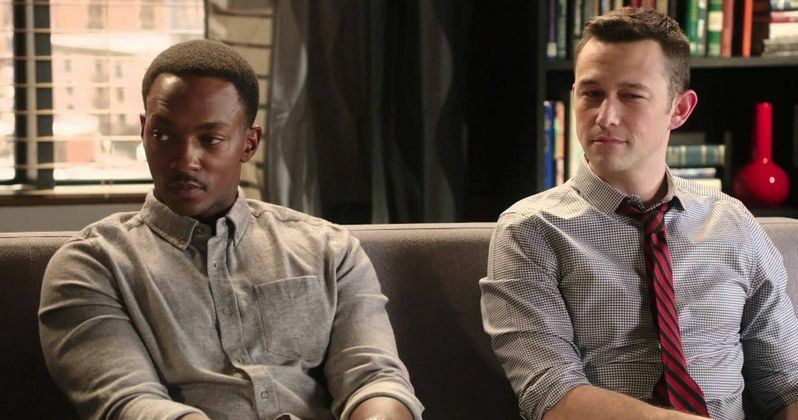 The comedian has a role in the The Night Before, and to promote this upcoming comedy, Comedy Central has released a new video where Nathan Fielder interviews Seth Rogen, Joseph Gordon-Levitt and Anthony Mackie, in the most awkward fashion possible. The six-minute interview shows Nathan Fielder expressing his disappointment over how much his part was cut down in the editing process. They also discuss the hot-button topic of wage disparities among male and female actresses in Hollywood, but don't expect too many straight answers from this bizarre "interview." If that wasn't enough, Sony has also released a new red band trailer from The Night Before. Back in July, Sony Pictures released an epic red band trailer for The Night Before, which was chocked full of R-rated language and deranged, drug-addled behavior. With this movie hitting theaters in just eight days, the studio has released yet another red band trailer filled with new footage and the same adult humor one would expect from this comedy. This sure-to-be holiday classic reunites 50/50 stars Seth Rogen and Joseph Gordon-Levitt, with Anthony Mackie joining the fold to round out a trio of friends who celebrate the season in an unorthodox fashion. As we learn in this trailer, this particular night will mark the end of their Christmas Eve tradition, which started years ago when they all banded together after Ethan's parents died. As you can see in the footage below, along with the other previously released trailers, their night starts to go off the rails. This red band trailer features tons of new footage, including Chris visiting his mother, Ethan geting punched by Santa Claus and Isaac meeting a drug dealer played by Michael Shannon. Jonathan Levine directs The Night Before, working from a script by Seth Rogen, Evan Goldberg, Kyle Hunter & Ariel Shaffir. Seth Rogen, Evan Goldberg and James Weaver are also producing through their Point Grey Productions company. The Night Before will be going up against the highly-anticipated The Hunger Games: Mockingjay Part 2 and Secret in Their Eyes when it hits theaters on November 20. Take a look at the new red band trailer, which should be watched by viewers over 18 only, and the stars' interview segment with Nathan Fielder.